FOR THOSE READERS not familiar with Mr. Bacon, he has been taking the writers-who-blog world by storm with his cuteness, his sass, his bendability—and his willingness to pose for endless photo ops. Mr. Bacon is currently on his first U.S. tour. 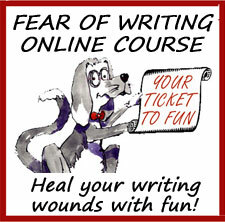 His booking agent has generously agreed to allow Mr. B to join my readers on the Fear of Writing Blog for one of his inimitable adventures. Being a sturdy little fellow who will stand up to anybody, and who’s not afraid to have his picture taken at a presidential press conference, I assumed Mr. Bacon would be game for an adventure in the wilds of our Ohio back country. So I took him captive . 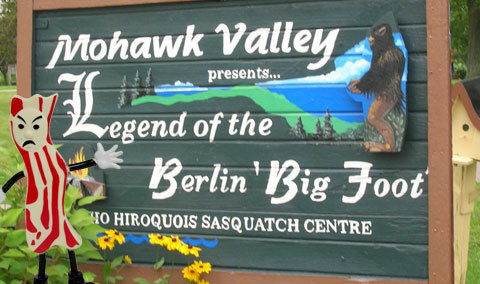 . . um, er, I mean, I took him out to Berlin Center—a quaint little village in Mahoning County—to look for the Berlin Big Foot. 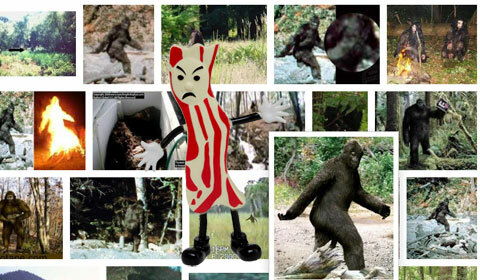 First, though, I was obliged to educate Mr. Bacon on just what a Big Foot actually is. 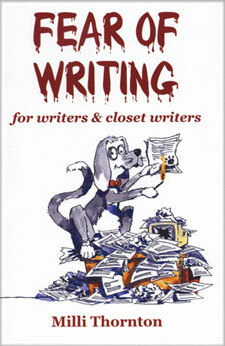 He claimed to have led a sheltered childhood and insisted that none of the writers he’s visited so far had read picture books to him about this. In fact, I’d say “taken aback” would be a watered-down version of events. I actually had to prise Mr. Bacon off my leg, and I had the distinct impression he was FRIGHTENED. I didn’t think much of it when I had to drag him to the car for our trip to Berlin Center . . . but it did really annoy me when he kept putting grease marks on the windows of my Accord trying to claw his way out. When we got to Berlin Center, it was broad daylight and (naturally) there were no hairy monsters running through the center of town. But when I asked Mr. Bacon to pose with the Big Foot sign, he practically had to be tied to the sign. He kept blubbering “Mommy!” (though he says he’ll deny that in every court in the land). Now, Mr. Bacon has been described as everything from a rapscallion to His Greasiness. He’s an in-yer-face kinda guy who did not hesitate to air his pugnacious opinions about the National Book Festival when he attended with Patrick Ross of The Artist’s Road. He’s been known to drive an ATV single-handedly through the Arizona desert while visiting Melissa Crytzer Fry of What I Saw. He even chose and paid for his own hiking boots at L.L. Bean in Maine while being hosted by Julia Munroe Martin of wordsxo. So what was his problem? This guy is not short on kahoonies. How can a few pictures of some mythical scary creatures scare him so much? In a frank interview (at least, I think he told the truth), Mr. Bacon confessed that he is in fact BaconElvis, a Mr. Bacon tribute artist who gives appearances at bars and clubs doing a stand-up routine of Mr. Bacon Twitter jokes. Naturally, he comes onstage to the tune of C.C. Rider. 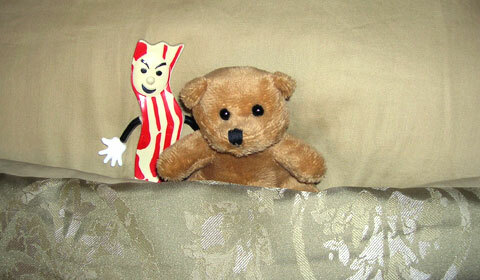 BaconElvis confessed that his fondest dream is to perform at International House of Pancakes during breakfast. Or, even better, The Blind Pig Restaurant in Cleveland. 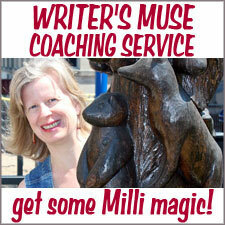 Milli Thornton: I predict you’ll end up in a book. 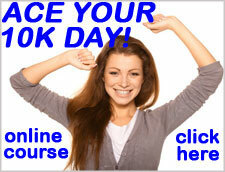 Squashed between the pages by an angry author or starring *on* the page as the main character . . . we’ll see which one it’s to be. Mr. Bacon: I take your prediction of book squashing as a personal threat, and will be on the lookout for a woman carrying a Fear of Writing book in her hand. 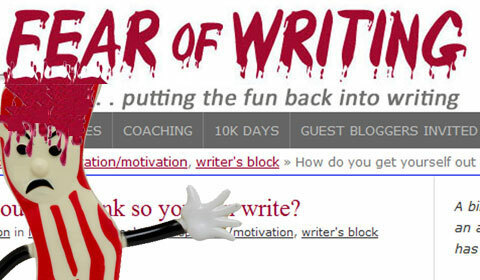 Evidently, BaconElvis has developed a phobia that the blood dripping from the title on my blog header is actually drip-drip-dripping on his head . . . and then slowly down into his eyes. After I wiped the imaginary blood from his peepers, BaconElvis said that now he can finally read the title of my blog properly. 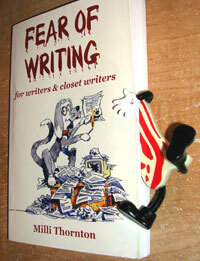 “I thought it said Fear of Writers,” he snarled, with a dirty look in my direction. It happened to be that special time of the year (October 31) when the imaginary blood was dripping. I thought that would be the perfect mood-setter for the holiday! But when I asked BaconElvis if he’d like to dress up as a tribute artist covered in blood and help me greet the trick-or-treaters on Halloween, he said (actually, he shouted, while wringing his cute little jazz hands) that he wants to be taken to an asylum for wigged-out Bacon Boomers and just REST FOR ONCE. No autographs please. The artist is recovering from his interview. Oh My God! 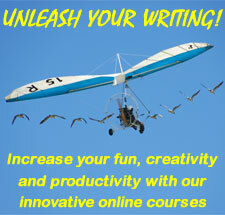 So funny – I was chuckling quietly to myselft until the Elvis bit – that did it! Hilarious. I don’t understand this Mr Bacon stuff at all, where he came from etc… but I’m not sure I need to! Let the madness continue. 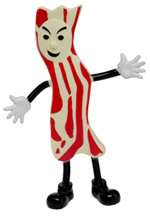 Mr. Bacon would dispute this account, but his story began when my teenage daughter, who knows my love of bacon, bought me the figure for my birthday. 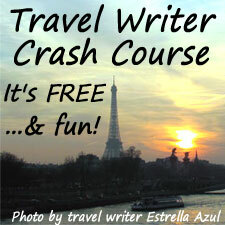 He then crashed our family vacation, and then crashed my blog. You can actually track his origins back still further, as @KateArmsRoberts posted a link to the site that sells him on my blog after yet another bacon-focused post. He still appears at times on my blog, most recently last Friday. Now that he’s gone viral, however, I no longer have any pretense of control over him, nor do there appear to be any more connections made in his travels back to his origins. But perhaps this background is unnecessary. Mr. Bacon IS. Mr. Bacon abides. Ah Milli this is so cute! 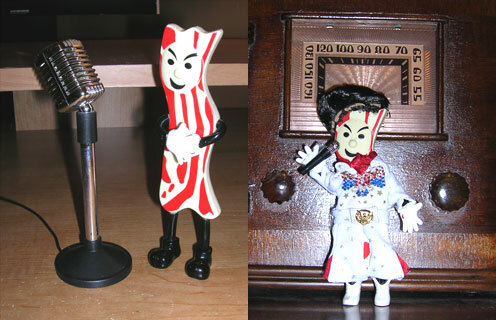 I love the little Elvis outfit Mr. Bacon wore…he didn’t confide about any of his singing aspirations to me. You’ve really got the knack for getting him to open up! Hope you can get those windows clean…we were finding grease smudges for days after he departed! Made me laugh throughout. Thanks for this Milli, brilliant fun, and long may Mr Bacon’s adventures continue. Very funny! Love everything in this post! Hahaha! Hey, so we’re famous for our Big Foots out here in the Northwest. We call them Sasquatch. You think Mr. Bacon would like to visit? I love reading all your post its very funny..Thanks a lot for sharing this Mr.bacon funny stories..
Oh dear. Seeing that cute little porky guy gave me a lump in my throat. I was to experience a visit from the east coast Mr. Bacon — but it seemed he got turned around in the post. Now I’m worried he might have found his way out west and stumbled onto the path of Bigfoot. I really enjoyed reading your post it’s very funny. Thank you for sharing this Mr.Bacon funny stories. I like it so much and job well done.